For that price, in addition to a $1,500 initiation fee, fed-up highway commuters can take part in the company’s new private travel service FreshAir, which launched in November of 2015. 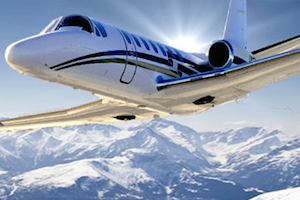 FreshAir, the first private air-travel service in the state specifically targeting skiers, provides unlimited flights from Denver’s private airport in Centennial, CO, to and from Aspen, Telluride, and Eagle-Vail on one of the company’s eight-seat Citation Bravo jets. The service allows travelers to book last-minute flights equipped with first-class amenities. Flights depart Thursday or Friday and come back Sunday or Monday. FreshJets works with private aircraft to market private jet flights available all around the country. Wozniak launched the company in 2014 with business partner Johnny Sengelmann. The startup does not own any of the planes listed on its site, but instead provides an online platform, freshjets.com, where charter companies can list private flights that would otherwise be flying empty, at a discount rate. FreshJets works with more than 5,000 carriers and 90 companies, according to Wozniak. But he disagrees that its model is similar to Uber’s. Robert Mann, an airline industry analyst and consultant, said one of the aviation industry’s concerns with companies like FreshJets is that they do not own or operate their aircraft. Mann said that business model makes it difficult for consumers to know whether an aircraft’s operator and pilot are providing a safe, quality service. Wozniak said his company only works with platinum-rated ARGUS operators and that he is a huge proponent for regulating the airline industry to require companies such as his to fly safer planes. In the meantime, he’s a staunch proponent for the quality of aircraft operators FreshJets works with under current legislation. “The companies we work with in Denver have the most experienced pilots when it comes to mountain flying from a safety standpoint,” he said. Right now, FreshJets’ biggest clients are corporate and business travelers who are booking trips for large groups. Individual memberships are not as common, he said. That’s because the cost for corporate members can make a lot of sense. One example listed on the FreshJets blog for how booking a private jet could be less expensive than a commercial flight is for a route between Los Angeles and Las Vegas. FreshJets said that would typically cost between $80 and $150 per person. In comparison, the company said, a group could book an eight-person private jet on its site for as low as $699 for the whole plane. Wozniak told the Denver Business Journal last November that FreshJets’ revenue has been averaging $153,000 a month this year — up by more than a factor of seven from 2014. The company makes most of its money from charging aircraft operators a licensing fee of about $1,000 per aircraft per year to be listed on its site. He said since then, FreshJets has seen an additional bump in revenue with Cyber Monday of 2015. The company served more than 500 passengers that day, booking flights for the holidays into June of this year, he said. Wozniak said he’s not sure if the airline industry will ever get to the point where everyone is booking private jets instead of flying commercial. “Legacy airlines are never going anywhere,” he said. But he does see FreshJets attracting more travelers who are willing to pay for convenience and style and who are attracted to the sharing economy. “You’ll see chunks taken out of first class,” he said, referring to people leaving commercial airlines for private jet travel in coming years.